IT'S WINTER NOW SO MUDGUARDS PLEASE! 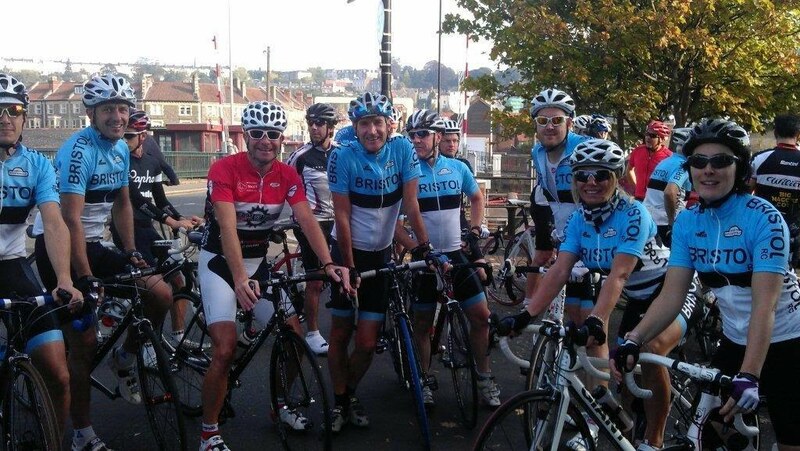 Every week, Bristol RC Saturday Club Runs, meeting at BW Cycling at 9.00am. (Also now an additional Sunday Clubrun, from Business As usual in Lawrence Hill at 9.30am). Saturday Clubrun meets at BW Cycling (www.bwcycling.co.uk), just 200m from the Nova Scotia, which is undercover and opens at 7.00, so you can pump your tyres and fix your bike if needed. Led by an experienced rider, 50-60 miles at average 15 mph. Suitable for beginners to group cycling. These are on the first Saturday of each month, but are generally more popular in the summer months. Please email if you intend to come along and let us know your fitness level and experience. The Clubrun, led by Brian O'Kelly and Danny Cox. 60-70 miles at average 16-17mph. This is every Saturday all year round. The Elite Ride, led by Steve Thomas and Stuart McCombie. 70-80 miles at average 18-20mph. This is every Saturday all year round. New riders are always welcome, however please email if it is your first time so we can introduce ourselves and advise on how the ride is conducted. All riders are reminded that they are responsible for their own safety, individuals take part in any group activities at their own risk. We strongly urge all riders to obtain appropriate 3rd party insurance as a minimum, British Cycling can provide this. We have a variety of routes which go towards Wales, Cheddar, Weston-Super-Mare or Gloucester, mainly in the lanes avoiding main roads. Group riding can be dangerous and requires your full concentration and co-operation, so please take notice of instructions from the ride leader. Do not take your hands off the handlebars when riding in the group. In Winter please fit mudguards, for the sake of those behind you. Wear roadie gear, no baggy mountain bike shorts or back-packs, put everything in your back pockets that you require. That also means wearing proper cycling shoes with cleats, no training shoes please. No TT bikes or Tri bikes allowed. We prefer you also not to have tri-bar clip-ons, however if you do, never use them while riding in the group. We ride two abreast at all times unless instructed otherwise by the ride leader. Watch for warnings and instructions about road obstacles and turning. Then communicate these down the group as you become aware of them. Also look beyond the rider in front of you for such warnings and instructions. Ride as close to the rear wheel of the rider in front as you feel comfortable, however never overlap the rear wheel of the rider in front. When on the front of the group you are responsible for communicating the direction you are going. If you do not know then ask the ride leader. When you are on the front do not half-wheel the rider next to you. Always ride with your front wheels level, which means a stronger rider should ease back if his/her partner cannot easily keep level. Always think safety and take care of the other riders with you in the group. Check out this link for a little tutorial on Group riding. Over time we will start to attach the satnav routes below, these are often posted on our Facebook page.